In this article we are going to talk about your daughter, her sports and her back pain. If you are reading this article it is likely that your daughter has been diagnosed with lumbar spondylolysis, that is a stress fracture or cracks in her vertebrae that is causing her pain and preventing her from playing sports or from being a happy teenager. We will also explore the various treatments that may work and treatments that may accelerate healing and get her back to her game perhaps a little faster including a regenerative injection program to strengthen the core spinal ligaments. Your daughter is complaining of continued dull back pain. Sometimes she suffers a very unsettling acute flare up that causes you distress and great concern. You took her to a spine specialist where an x-ray and MRI showed spondylosis, a crack in the vertebrae segment of the facet joint called the pars interarticularis. Your doctor tried to reassure you that this was a common injury in adolescent athletes and that time should be taken to allow the fracture(s) to heal. You got a couple of prescriptions for anti-inflammatories, (to help with the swelling or edema in the bone marrow) and were told to come back after 2 to 3 months to check your daughter’s healing progress. In some instances, depending on the fracture, you daughter may have been placed in a hard back brace for 6 weeks and then converted over a a soft brace. Typically the brace would be more common for girls who compete in gymnastics, cheer leading or dance where bending the spine backwards would be more stressful than say basketball, soccer, volleyball or running impact sports. The more stress, the worse the fracture. Now after another 2-3 months, if your daughter’s back pain finally went away, you are probably not reading this article. You are probably here because her back pain did not go away. While your daughter’s back pain has lessened, it is still there and at this time she has not resumed sports. Your follow up visit with the spine doctor has been disheartening as he/she has told you nothing more can be done other than more rest. You did your research and you may have hit upon something. Physical therapy. Perhaps if you can get your daughter into an extensive PT program they can help strengthen her core muscles and provide stability that will help her heal faster. So you had the doctor, if he/she was agreeable, write you a prescription for PT and you and your daughter went with great optimism. Now if you had the 2 – 3 months of PT and your daughter’s back pain was alleviated and she was able to return to her sport, you are not here reading this article. If you are reading this article, you are still looking for answers. Later in this article we are going to present non-surgical options including the use of regenerative medicine injections to strengthen the core spinal ligaments. In this segment we will discuss the surgical options as presented by surgeons at leading medical centers. According to the research we are going to present below, for most adolescent athletes, conservative care will help them. For some, conservative care will fail and it is at this time that athlete, doctors, and parents start to consider surgery. For some patients surgery will be the answer, however surgeons warn, it is not the answer for every patient. Doctors in Poland at the Poznan University of Medical Sciences, offer these observations on surgery for the young elite athlete with spondylolysis: This findings were published in the European journal of orthopaedic surgery and traumatology (1). In those were non-surgical treatment has failed, pain associated with spondylolysis can significantly interfere with playing ability, if play can be maintained at all. A great disadvantage of surgery is the need for muscle dissection from the vertebrae lamina to the facet joint. This causes considerable tissue damage which, combined with a scar generated in the subcutaneous tissues, may limit the optimum functionality of the back muscles. This is particularly undesirable in professional athletes, where even the slightest change in the functionality of tissues may affect the results achieved in sport. Of course what would stand out to you is, it is 5 to 12 more months of recovery on top of the time invested already in healing. At this point of our article we are going to start presenting evidence that the research the surgeons are giving us on post-operative results can make a good case for non-surgical regenerative injections. We will present the evidence in the forms of clues. In our clinics, a young athlete comes into our office with problems of stress fractures of the vertebrae, herniated disc, and spondylolisthesis. The young athlete may have been in a back brace, may have been to physical therapy, may have taken an entire season off, yet here she is with pain. She is here because her parents may have explored a surgical option and are trying one last attempt to avoid it and one more attempt to help their daughter get back to the game she loves. How can we help her do this? Can we help her do this? You went to physical therapy with the idea that your daughter would be able to build up her core muscles and this would provide stability to the spine and cause her less pain. This did not happen. Why? Because physical therapy can not strengthen ligaments, those small connective tissue “rubber bands,” that hold the vertebrae in place. Why? Because physical therapy focuses on muscles and tendons. Ligaments are a different tissue then tendons. While both are strong connective tissue, tendons have an ample supply of blood that flows to them, ligaments do not. When compromised or damaged, tendons tend to heal quickly, ligaments because they do not have direct blood circulation to them, do not heal well. This is why in the most famous sports surgeries, ligaments are replaced with a tendon, for example, the UCL in Tommy John surgery or the ACL in the knee. Tendons heal better. So when this young athlete comes into our office, we look for spinal ligament damage and spinal instability by examining the curvature of the spine and by locating the pain triggers. Here we can identify the area of the fracture and apply treatments. We can not replace the ligaments with tendons, what we can do is direct injection treatments. Let’s look at some research first on the importance of spinal stability in treating lumbar spondylosis. A wear and tear stress vertebrae fracture is not something that occurs all by itself as an isolated injury. For this stress factor to occur, in many athletes, the proper inter-relationship between pelvic stability and spinal stability has been broken. This has caused hypermobility in the spine, sacrum, pelvic region and has caused misalignment and misconfiguration of the lumbar lordosis or curve. Let’s take these few brief sentences in. Your daughter can have spinal instability causing unnatural pressure on her spine causing stress fracture. 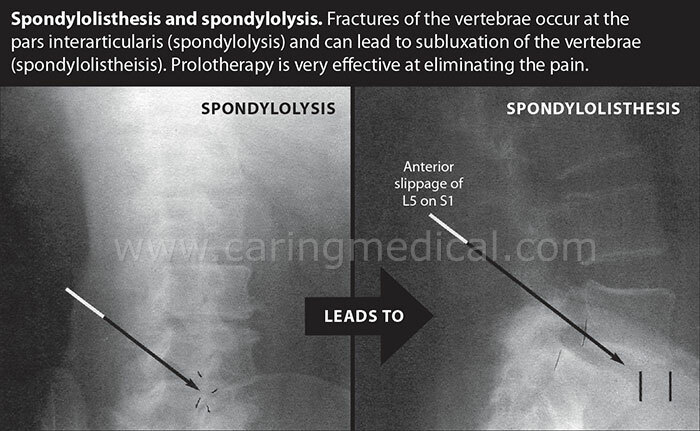 This fracture causing pressure is coming from a spine that is hypermobile, causing the vertebrae to move out of place. The spinal instability is putting pressure on the sacrum and pelvic region and causing the spine to loss or gain too much curvature, adding more pressure. When you put a surgical screw into the vertabrae, you are only fixing the crack, you are not fixing what caused the crack or what will likely cause another crack to occur. Analyses indicates that the cross-sectional area of the vertebral body was negatively associated with lumbar lordosis angle and an independent predictor of the presence of spondylolysis. This provides evidence that patients with spondylolysis have increased lumbar lordosis and smaller vertebral cross-sectional area of the vertebral body. What does this mean to you and your daughter? Spinal instability has caused a shift in the vertebrae so less of the vertebrae (the cross-sectional area) is actually supporting the weight of the spine. The pressure of the curving spine, the less weight bearing area of the vertebrae, is causing the stress fracturing and cracks. In our opinion how is a screw going to fix all this? This study suggests that prolotherapy using a variety of proliferants can be an effective treatment for low back pain from instability from ligament dysfunction for some patients when performed by a skilled practitioner. Citing our own Caring Medical and Rehabilitation Services published research (6) in which we followed 145 patients who had suffered from back pain on average of nearly five years, we examined not only the physical aspect of Prolotherapy, but the mental aspect of treatment as well. 75% percent were able to completely stop taking pain medications.